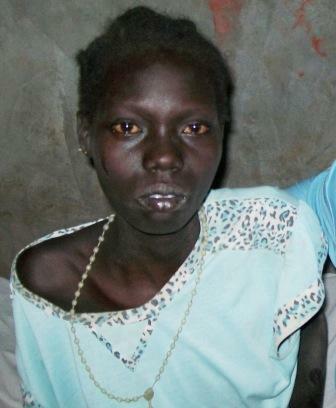 Our ministry, Eternal Perspective Ministries, had the privilege of covering the medical expenses for Achu, a 15-year-old Sudanese orphan who was suffering from a horrific open wound that threatened to take not only her leg, but her life. I asked the director of the ministry in Sudan to share her story in the guest post below. This is wonderful and amazing, and it is our privilege to help. It makes me cry just to see Achu’s smiling face. I look forward to meeting her someday, in a far better world, where pain and suffering will be no more. Can you remember what it was like to be a kid between Thanksgiving and Christmas? For most of us, the anticipation of Christmas coming was all we could talk about. Some things are like that—they’re so good we can’t get them off our minds. That’s definitely the case with the story of a Sudanese orphan named Achu. Even though the New Republic of Sudan seceded from Sudan in 2011, after five decades of Islamic invasion, slavery, and genocide, there is still no infrastructure within the fledgling country. In fact, much of it is still under attack and bombed on a daily basis. 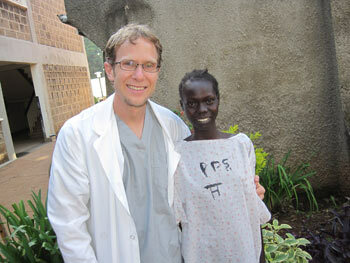 I called my friend Dr. Carol Spears at Tenwek Hospital in Kenya and asked her if Tenwek would be able to treat Achu. Dr. Carol informed me that not only would they treat her, but also that Dr. Dan Galat, on staff, was a Mayo Clinic-trained orthopedic surgeon. Miracle number too-many-to-count—a Mayo-trained orthopedic surgeon in the next country over, who was willing to operate on Achu! But we would need the stream of miracles to flow with whitewater power; getting Achu out of Sudan would be no small task. In order to justify not giving up any of his booze money, Achu’s father denied Achu needed help. 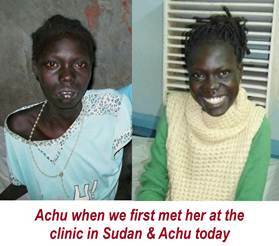 So, even though we offered to cover all expenses from the private charter to get her out of war-torn Sudan, to medical expenses in Kenya, to food and lodging for her big sister to accompany her along the scary journey, Achu’s father refused. Drunken Sudanese men do not easily or usually change their minds, nor admit they are wrong. Slowly-by-slowly, as they say in Sudan, I kept making plans through Dr. Carol in Kenya, and believers from Alabama to Switzerland and Sudan to Australia kept filling up that no-man’s-land with prayers. The stream of miracles raged on against the gates of evil, and Achu’s father suddenly agreed to let her go even as the local commissioner rushed together all the required travel documents. Hebrews chapter 13 comes to me. With passionate exhortation the author exhorts us to stop trying to live the privileged life, and to go outside the camp—where Jesus lived and died, where the action is. I have lived on four different continents and traveled to many others. I know of no other place farther “outside the camp” than Sudan. 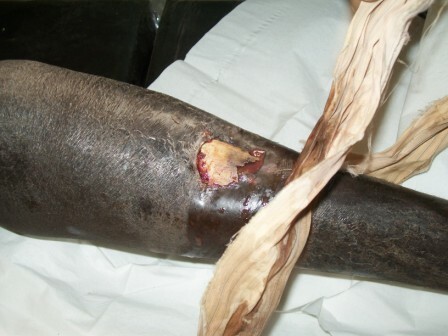 As our orthopedic team evaluated Achu, the foul smell of necrotic flesh was strong, and our first thought was "there is no way to save her leg." 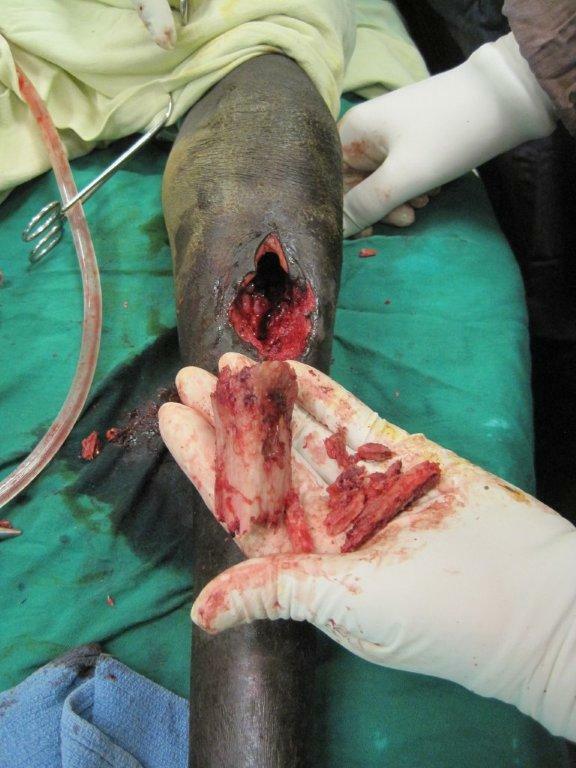 The piece of protruding bone was too large and after removing it, we were concerned that the remaining defect could never fill in with new and healthy bone. However, we were encouraged, as x-rays showed a surprisingly large bridge of new bone posteriorly, which explained why Achu, despite her condition, was still able to walk, bearing weight on her leg. In addition, we had the sense that God was at work and we were just along for the ride. So that same day, we took Achu to theatre, and removed this piece (approx. 3 inches) of dead sequestrum. Indeed, the hole it left in her leg was cavernous, but we could feel the bridge of bone posteriorly, and the leg miraculously felt very stable. Her story reminds me of Hagar, who when she met God, called him El Roi, "the God who sees me" (Genesis 16:13). God is answering her prayers (and the prayers of many others) and we are privileged to be a small part of this process, seeing yet another one of God’s miracles on behalf of the poor at Tenwek. I am humbled and moved to worship the Father who sees the neglected, the abused, and the hopeless. 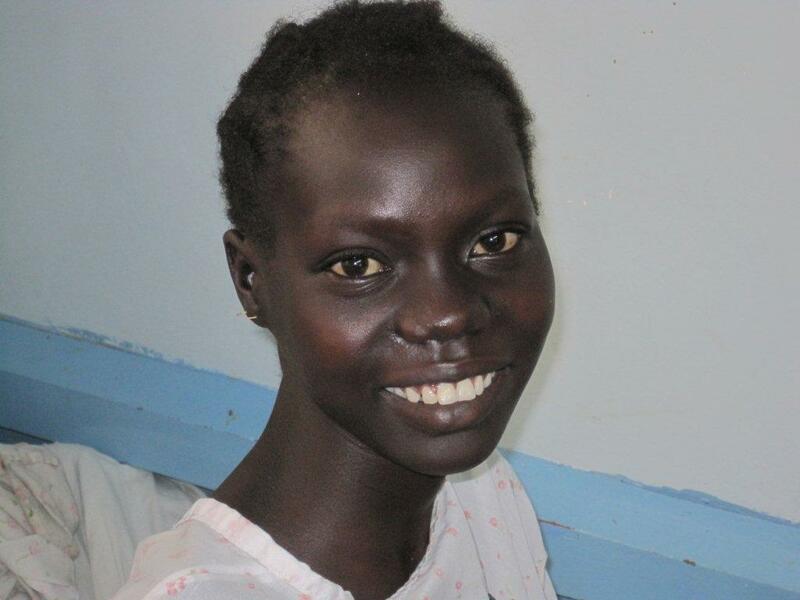 Dr. Galat shared some specific prayer requests: that the new bone continues to strengthen and remodel so that it is healthy; that the defect would fill quickly with healthy granulation tissue; and that Achu’s time at Tenwek would allow her to experience how much God loves her. And thanks to those who kindly support EPM with your financial gifts. You have had a major role in the life of this little girl, and countless others. Those of you who have prayed for Achu will be interested in this update. Check out the before and after pictures of this precious child.